“From above the world of Cars…” is the teaser from the promos, intended to remind potential viewers that “Planes” is another view into a beloved universe created by the folks at Pixar. This teaser ends up being rather unnecessary – since everything about the movie, from the cow-tractor cameos to the underpinnings of the storyline cherry-picks liberally from the “Cars” franchise. As it happens, while the world was created by Pixar, the movie was created by DisneyToon – originally intended as a direct-to-DVD production and then shifted to a theater release. The movie centers on Dusty Crophopper (Dane Cook of “My Best Friend’s Girl” and “Good Luck Chuck”), a crop duster with dreams of becoming a racer. Dusty wants to compete in the “Wings Around the World Rally”, an around-the-globe challenge that would pit him against the world’s fastest planes. It’s a 7-leg challenge, stretching from New York City to Iceland, Germany, India, Nepal, China, and Mexico, before finishing back at the starting line in New York. In desperate need of a real trainer, Dusty and his trusty sidekick, the gasoline tanker Chug (“Everybody Loves Raymond” actor Brad Garrett), enlist war hero Skipper (Stacy Keach, a TV/movie veteran of everything from “Mistral’s Daughter” to “The Bourne Legacy”). 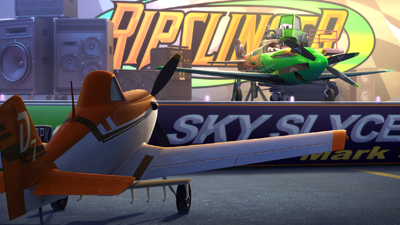 The cranky Skipper is highly dubious that Dusty has what it takes to win, especially when it’s revealed that Dusty is terrified of heights and will only fly less than one thousand feet off the ground. Nevertheless, Skipper trains him – and then off goes Dusty for a Rally qualifier. He manages to hold his own but initially fails to make the cut-off; however, thanks to the aerial equivalent of doping discovered in another racer, Dusty squeaks into the qualifying group and heads off for the Rally. It’s there that he meets a suite of racers from around the world – including the refined and sarcastic Bulldog (“Monty Python” icon John Cleese), the amusing and sweet El Chupacabra (Carlos Alazraqui of “Reno 911!”), and the dastardly and arrogant Ripslinger (Roger Craig Smith of “Wreck-it Ralph” and “Marvel’s Avengers Assemble”). Dusty squares off against a field of talented and much faster planes, trying to prove to himself – and to others – that a simple crop duster can manage to be something more. As Dusty explains while wistfully examining the Rally’s course on a world map, “I’ve flown thousands of miles and never been anywhere.” He struggles with his own limitations as much as others struggle with them, but the more he competes the more he’s able to stretch even his own idea of what he can and can’t do. 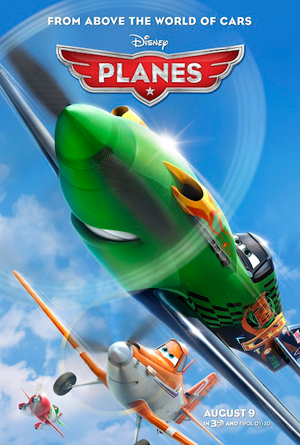 The only problem with “Planes” is that, as much as it’s a new production, there’s little about it that’s truly original. 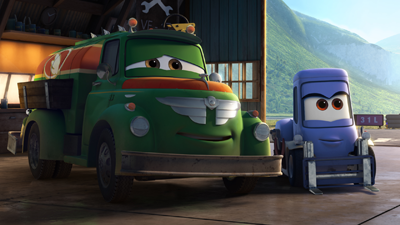 The concept of a young hotshot in need of guidance from someone more seasoned is territory well-mined in the relationship between Lightning McQueen and Doc Hudson in the first “Cars” film. Keach’s gravelly voice makes the cantankerous Skipper a gray, aerial Doc, and the green villain, Ripslinger, was very much Chick Hicks with a propeller. Even the idea of a multi-leg, around-the-world race between a mouthy, arrogant nemesis and the good guy was well-covered in “Cars 2”. The only real original bits came with El Chupacabra, especially around his romantic intentions towards Rochelle, a French Canadian plane voiced by the ever-talented Julia Louis-Dreyfus (“Seinfeld” and “Veep”, among many others). The rest of the movie seemed very much a recycling of “Cars”-world motifs and storylines, sometimes with the roles reversed, but ultimately so similar that this wasn’t so much “from above the world of Cars” as it was just “from Cars”. 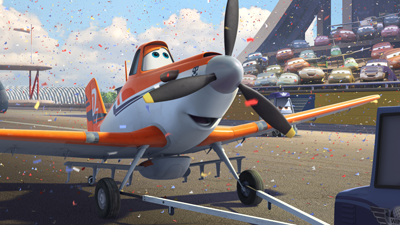 A cute tale with only a small amount of scary bits in it, “Planes” is a perfectly fine film for kids. The run time is just about 90 minutes, so it’s a quick enough film for viewers of all ages. Also, I saw this movie in 3D and while I’m sure it’ll be available in 2D, there’s something to be said for seeing this with the additional depth that 3D brings. While this movie used some of the same technologies routinely employed by Pixar and even had some Pixar heavyweights in lead positions (like Executive Producer John Lasseter), this was a Disney-made movie. Clearly, the cross-over worked well from a technical execution standpoint; the renderings were nicely done, with good texture on the trees, grass and other items that have variable surfaces. The smooth surfaces of cars and airplanes tended to look too shiny and unreal – but this is how things looked in “Cars”, as well, so I’m less likely to think that a limitation of the DisneyToon team. As an approximation of a Pixar flick not from Pixar itself, this is very decent work. For fans of “Cars” and that universe, this is a fun, brief diversion. If you’re looking for something original and breathtakingly new from Disney, this won’t really get you there…but maybe the upcoming sequel (“Planes: Fire & Rescue” – advertised at the end of the credits) will provide something new for Dusty and Co.
“Planes 3D” opens nationwide on August 9, 2013. This movie is rated PG (Parental Guidance suggested) for some mild action and rude humor.